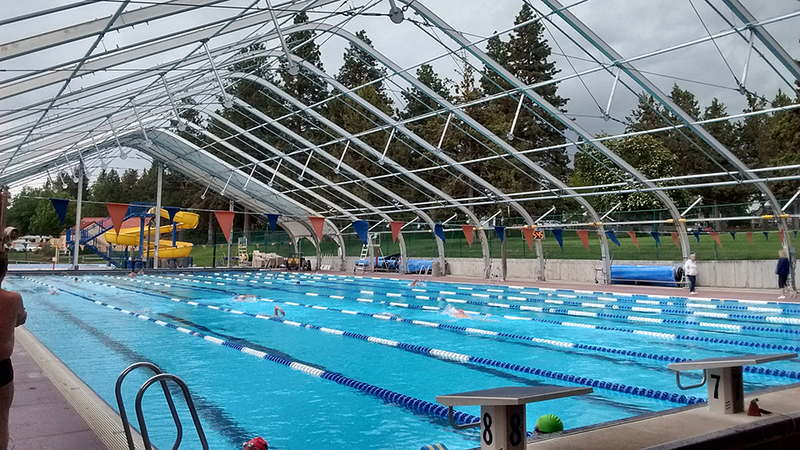 Owned and operated by Bend Park & Recreation District, Juniper Swim & Fitness Center is a state of the art community health facility with a variety of quality fitness and aquatic programs open to people of all ages and abilities. Members and day pass holders can take part in a number of classes, including yoga, spin, strength training, prenatal, Zumba, P90X, and F.I.T. Children’s programming keeps little ones entertained and healthy, and onsite child care is available each day, as well as family changing rooms for those who want to get ready with their small children. The snow often flies early (and late) in the season in Central Oregon so Juniper’s indoor pools are very popular with serious swimmers and water lovers alike. Year-round swim programs are available for all ages, from lessons for children as young as six months to youth swim teams to adult master swim sessions. In the summer, the outdoor pools open up, including a large water play area complete with water slide. Juniper Swim and Fitness is also a popular birthday party destination, and private party rooms are available to rent. The center is open seven days a week and classes, camps, and events are added on a regular basis so please check the website for current scheduling information.